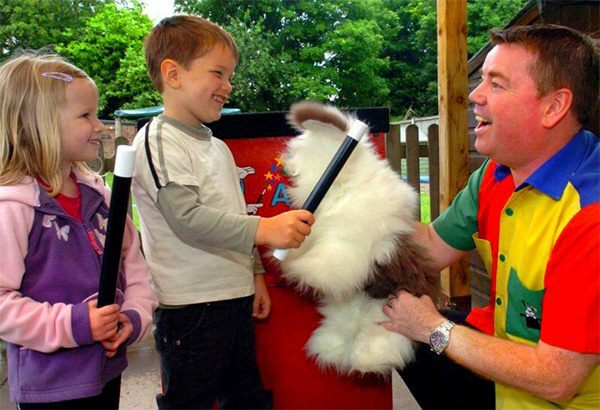 Andy the Children's Entertainer and Magician with great magic show full of fun and laughter that kids of all ages will love. As a children's party magician Andy is one of the busiest around. Andy's One Hour Party package will entertain children of all ages and is great for all occasions including: birthday parties, Christmas parties, schools, playgroups and children's nurseries in Bromsgrove, Birmingham, Worcester, Solihull, Wolverhampton and Kidderminster. Andy's Hilerious Comedy Magic Show"
Included in the One Hour Party Package from Andy, Kids Birthday Party Entertainer and Magician, are those long thin twisty balloons that Andy, Party Magician, will turn into an amazing variety of animals and other objects. These balloons will be given away to the children at the end of the magic show. Amongst the favourites of these are: The Pink Panther (see picture left) dogs, cats, teddy bears, swords, a great big motorbike, hats, parrots, dinosaurs, elephants, air-planes, Monkey in a banana Tree and Many More. 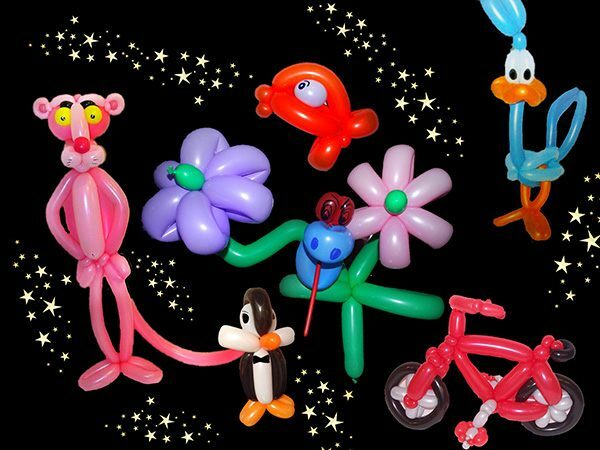 These great balloon creations are given to those who assist Andy in the "Magic Show". Up to 25 kids and its all in the fee if the numbers go higher they maybe a small extra charge... but Andy will make sure all the children at the party get a balloon animal each. Watch Andy's Magic video and see why so many parents and customers perfer to book Andy's magic shows to other entertainer or magician. You can choose from the 1 or 2 hour party packages (most popular) or call Andy and ask about a bespoke package tailored to your exact needs. This is ideal for weddings, christenings, special events, private and Christmas parties. Call Andy the Magician now on 07976367058. Don't forget the limited time, special offer - £10.00 Off your next booking. Satisfaction is guaranteed. For a magic party and entertainment give Andy a try you won't regret it.